I have over 30 years of marksmanship training both Marine Corps and federal law enforcement. I can say without a doubt that this training highly exceeds my expectations of civilian firearms training. Lance is professional, concise, and enthusiastic. The classroom environment was clean, quiet, and comfortable. The verbal presentation was given in a clear and professional voice. The ambiance was engaging and interesting. The range clean, well maintained, and easy to access. I can not recommend his training enough. Thank you. Enjoyed the class from start to finish. I learned a number of new things that are useful and practical. Range control and safety was exceptional. My wife and I took range shooting practice with Lance and were impressed with his professionalism, friendliness and instruction. We decided to take our LTC with him as well. As we expected, his instruction was thorough, his approach both professional and friendly. His style was relaxed, and made sure you understood the material and felt free to ask questions. After both the range instruction and classroom we feel very confident and capable in our knowledge and skills. Great class! Just took the class 1/27/18. Lance did a great job both on the classroom side of presenting the safety, legality, and practical information in a format that made it very interesting. The communication was very well done. Took time to follow up on the most important aspects of carrying. Range experience was very well done. Safety was always being communicated to prevent any issues. Could not have had a better classroom and range experience. Highly recommend this course for anyone wanting to understand the process in detail. Set up a private 2hr class for my wife to learn to handle a gun then later take a CHL class from Lance. Being married for over 25 years I am hot going to tell her how to use a gun, I let the professional to it she will listen to him. When it comes to gun safety you never go cheep. Best money I ever spent. Lance did a great job, got here fear of shooting over with and very patient. Now we can go to our place and shoot and she will be ok. Thanks Lance will be back for CHL soon. My wife and I enjoyed the class. Lance went over lots of information with us. Lance was very friendly and answered all of our questions. There was coffee and other beverages Lance provided for the class. The range was great too. Lance was great with instructions regarding firing your weapons and being safe. I would definitely recommend Lone Star Gun Training! I thoroughly enjoyed and appreciated my LTC class from Lance last weekend. I learned so much and he made it very enjoyable too. Super informative, helpful, knowledgeable and he provided so many additional tips to make you think about what you’re doing and how to apply laws to real life situations. He was very professional, including on the range. He helped anyone that needed guidance and he was cautious to keep us all safe. He even spelled out the details we all have to meet to get our license. I have no complaints, just compliments! Could not have chosen a better all-around instructor and course! My wife and I thoroughly enjoyed the class yesterday. We learned some really good information, and really liked Lance. Super guy! He was personable, very knowledgeable, and shared some interesting tips, anecdotes, and stories. He also made it very comfortable to ask questions. He lead the range and shooting test with good command, organization, and clear instruction. If a shooter had a gun problem, he took charge and kept the situation safe, which I appreciated. Another thing I thought was great was his communication and organization before, during, and after the class. For instance, he included clear requirements about gear to bring and clear directions on how to get to the range in an email prior to the class. After the class and shooting, he made it clear on the steps to take to apply and get your LTC. And then he followed up with a good, informative email too, which included helpful links and our class picture. Nice touch. There was really nothing left ambiguous or confusing. I would highly recommend him and his training. Thanks Lance! Lance provided excellent, pertinent instruction in the classroom and spot-on range control at the qualification test on the range. You won’t find better LTC training in Central Texas. Mr. Mitchell kept the class very light and entertaining but very educational at the same time. You don’t even feel the 4 hours. The range portion was great. Everything was very safe, orderly and couldn’t have imagined a better class for me and my wife. She loved it too. He tells you everything you need to know and need to do to finish the process and leaves an open line of communication afterwards. I am DEFINITELY recommending this course with Lone Star Gun Training to everyone I know. Lance did a excellent job during the LTC classroom & field instruction. His presentation skills kept the classroom material informative, interesting and thorough. The field instruction was efficient and safe, we moved through the required distances and exercises quickly and safely. I and two friends attended the CHL training with Lance and found him to be professional and personable. He was very knowledgeable and was more than willing to help those with less experience. This was a very well organized, simple, and entertaining class. Well worth the price and time. My wife and I truly enjoyed ourselves. Well run, safe, and informative. Lance is well versed, qualified, and efficient! I highly recommend LSGT and Lance as your firearm instructor. Completed the LTC class with Lone Star Gun Training and it was a great experience. Lance is a great instructor and very knowledgeable; always emphasizing safety and continuous training. Keeps the classroom training content informative and interesting. He was very friendly and looking forward to do other trainings with Lance. I highly recommend LSGT and Lance as your firearm instructor. The class and range testing were both incredibly helpful, informative and engaging. Lance offered lots of practical advice and emphasized safety and the importance of ongoing education beyond the class. He was fantastic instructor and I highly recommend him and the class to others! Just completed the class today and it was a great experience. I was dreading this class since lets be real it’s going to be dry and boring for the most part. But the class is very informative and Lance made the class so easy and enjoyable. Lance went over the important parts of the course and focuses on what we should do in situations and broke things down. IF you pay attention to the class you will pass the written exam it is not rocket science and the way Lance puts the information you will learn the right thing to do. So just pay attention to the course. The classroom was only 4 hours with breaks and he provides you water and sodas. Again very very enjoyable time for this class when I was walking in dreading the course. The class does start promptly at 8am so make sure you are on time! Lance then takes us down to the range a bit away from the class and we get ready to shoot, it is an outdoor range so bring sunglasses if you can because it was a bright sunny day. We got loaded up and he instructed us on how many rounds we will fire and how quickly to fire them. AT 3 yards I used my M&P Shield and it was no problem, we fired 20 rounds total at 3 then moved to 7 yards. Again another 20 rounds not too bad with the shield with a shorter barrel. Then we moved to 15 yards and fired 10 rounds I hit the target and mostly in the 7 range at 15 yards. Again all this is happening with Lance giving us instruction on how many rounds to fire and how quickly to fire. Great class very enjoyable if you are going to take a LTC course take it here with Lance you won’t be disappointed. Tip for the range bring a full size pistol with a longer barrel just helps with accuracy, doesn’t necessarily have to be the gun you are going to be carrying that you are going to test with. I initially signed up to take Lance’s LTC class the middle of September, but after going to the shooting range and seeing how terrible I was at only 3 yards, I panicked and postponed the class. After much practice at the shooting range I felt brave enough to take the class today. What a great experience today’s class was! Lance made the class so interesting. He has such a great sense of humor too. We had so many good laughs with the videos he showed today and the funny stories he told about his own experiences. He made the learning experience interesting and fun. People pay better attention and take in more when they find the learning experience interesting and upbeat. I also chose Lance’s LTC class since his price was $69 compared to most of the competitors overpriced $100 and $120 rates. The shooting range is a quick 7 minutes from the Holiday Inn Express and was a very easy and quick transition from the classroom to the shooting portion of the class. His instructions at the firing range was clear and very easy to understand, and he was extremely patient and helpful with each individual student who had any trouble with loading their weapons or understanding the commands. What a nice touch when Lance took a photo of all the students after the class completion and sent a copy to everyone’s email along with instructions for how to follow through with the DPS to get your license. Lance also had beverages and coffee available during the class at the Holiday Inn Express. Lance is just an all around nice, friendly, honest guy too, with just the right temperament to teach this kind of class. I would highly recommend his class over all the others, especially since his price is very fair compared to the many other overpriced LTC classes out there. I have taken this class a few times, mostly because of my travel schedule and not my ability to close things out. That being said, Lance is hands down one of the best instructors I have had, to include Super Nintendo Duck Hunt Grand Master, Ali Babba and His Forty Pistoleros, and the US Army Marksmanship Unit. I highly recommend his class, and was very impressed by his aptitude with firearms as well as conflict resolution (he convinced my girl that she shot better than me, way to go Lance!). In all seriousness, I would highly recommend this class to my family, which is about as good as rec as I can give. Lone Star Gun Training was highly rated and a much more reasonable cost than most the other License To Carry (LTC) training courses found on the Internet. The website is very informative, easy to navigate, and the calendar made it easy to select a convenient date for the class and range qualification. Lance Mitchell is a great instructor, and kept the course content informative and interesting. Pay attention to what Lance says in the training and passing the written test is no problem. The range qualification was very organized, and Lance controlled the activities to ensure everyone was safe. I highly recommend Lance and the Lone Star Gun Training. I was a bit apprehensive at the start as I did not know what to expect on the classroom or the shooting range. Lance did an awesome job of teaching the material and was very patient and willing to assist on the range. This was a great class. Also the price is the best around. I have no idea why anyone would want to pay over 100.00 plus for an LTC class. The price, experience and instruction of this class taught by Lance are top notch. Do not go anywhere else. Took The LTC class with Lance. The class was awesome , very informative and Lance truly shows his passion for proper training and technique. The class material was engaging and Lance did and excellent job ensuring we all were very comfortable on the range . I highly recommend Lance and his training for anyone looking to have private shooting lessons or get their LTC license. Awesome! It was a pleasure to learn from instructor Lance. He was very friendly, honest about what he was teaching, didn’t do or say anything to make anybody feel out of place for having little to no knowledge about guns and the laws that go with them. His class was great and made me want to learn even more than what I know now. I would most definitely recommend his course to anybody in the central Texas area that wants good, honest, hands on learning! Thank you! Highly recommend! LTC class went by quickly because Lance is both informative and entertaining. We’ll be sending our friends and family! LSGT was great for my LTC training. My instructor Lance M. was great. He was patient, to the point, and has plenty of experience. Best of all, I felt safe at the range for the [shooting] qualification test. The price is good, and they got me in the class pretty quick compared to others I looked into (I had to wait about 2 weeks). I noticed that he took time with some people that needed it, which tells me he really cares about instruction and not just making a dime. Thanks Lance / LSGT. I took the private lesson yesterday with Lance . I had never shot a gun before and Lance was amazing . He took the time to explain gun safety first, then walked me through the steps of proper handling and shooting . He was very patient , informative and professional and could answer any question I had and gave the rational behind his answer . If you want the best of the best in gun training and handling , he is the go to guy ! We are taking the license to carry class in a few weeks and can not wait ! Thanks again Lance for all the confidence and knowledge you gave me !!! Lone Star Gun Training is comfortable and provides a no stress highly informational classroom experience in a hotel conference room in Georgetown. Coffee and water are provided along with several breaks to get up and stretch. The gun range is close by and not crowded. It was a fun experience. Lone Star Gun Training is pretty organized and [they] have a very good system. I didn’t have to make a call or talk to anyone to figure how to register for the LTC class. Their website has all the information and links I needed to get a scheduled, enroll, connect with DPS, and fingerprinting, etc. It is so easy to use and steps one can follow to complete the whole process. Lance (owner and instructor) was quick to [send] follow-up emails confirming the enrollment, what to expect, what to bring, and what not. Although he asked to give him a call or email for any question, I didn’t feel the need to due to reasons mentioned above. The class started promptly and everything was already setup and organized when I got there ~15 [min.] before time. Breaks were given as promised. Coffee and water were provided too. He also informed us ahead that there will be no lunch break and that we have to bring some food with us and eat [during] breaks. It was raining the last few days before the class so the ground was muddy, but Lance provided us the plastic bags to [cover] our shoes before [going to the range]. To sum it up, the whole process and experience was great, and I would highly recommend this to family and friends. My husband and I completed a private 2-hour [basic pistol orientation] session with Lance today and we were so pleased! Compared to what it would cost to take some other NRA “FIRST” courses that offer the same sort of “basics of handguns” the price is competitive, especially if you take advantage of that he allows up to 2 people to attend the session [for the same price]. He starts with the true basics, from things like ammunition types, to the different parts of each gun. We both left feeling much more confident and excited to improve our skills! The class was informative and addressed not only gun safety and the law, but also situational awareness and critical thinking when it comes to potentially dangerous situations. Mr. Mitchell was very professional, while the content was up-to-date and relevant. I would recommend Lone Star Gun Training. I took the CHL class this past weekend with Lance. I have been putting off taking the course because I was nervous I would be the least experienced one in the class. Lance makes you feel so comfortable and treats everybody the same no matter how much prior experience you have. The class of very informative and the shooting portion goes by extremely quickly. It wasn’t long and before I knew it, I was leaving with course completion certificate in hand. Lance even sends a follow up email with lots of useful links. He also [used a little] humor in the class, and it was much appreciated! I highly recommend this class to anyone. He was even one of the cheapest classes I found! On Saturday, November 7, 2015, my wife and I took the Texas CHL class from Lone Star Gun Training. Lance was an amazing instructor! He did an awesome job at keeping the material interesting and engaging. Lance was extremely patient and always took the time to answer questions that his students had. I felt completely prepared when it came time to take the written test. During the range qualification, Lance did an amazing job at ensuring that everyone on the range was operating in the safest manner. I had complete confidence in the safety of the range the entire time. I highly recommend you take your CHL class from Lone Star Gun Training. Lance is a great instructor, and you can tell that he truly has a passion for teaching future CHL holders! I highly recommend Lance with Lone Star Gun Training. The CHL class was very informative and engaging. Lance used some great videos and provided very useful insight. Additionally, he provided drinks for the class. The gun range was close by and he did a very nice job of balancing everyone’s needs vs not letting the class take all day. I have already recommended Lance’s class to my friends and would recommend for anyone planning to get their LTC. Thanks Lance! I took this class based largely on the reviews from Yelp. I was not disappointed! Lance is a great instructor. He was clear with his instruction, easy to follow, humorous, and as a consequence, everyone easily passed the written test. The shooting range for the qualification is a short drive from the Holiday Inn. Lance took command at the range to ensure everyone followed the safety rules and understood the shooting requirements. I would highly recommend this class for anyone in the Georgetown vicinity. I took the class with Lance this past weekend and it was great all the way around. The classroom at the Holiday Inn was very nice and the short drive to the range for qualification was convenient. Two thumbs up!! Just took their CHL class and no complaints here. The 4hr class was very informative and helpful. Lance the instructor was very organized, well prepared and professional. He even provided free cold sodas/water bottles and coffee. Just be prepared to bring a sweater or jacket, the classroom which was held at a Holiday Inn got a little too cold for some. The gun range was outdoor (about 7miles away from where the class was held) so dress comfortably especially if you are taking this class during the heat of the summer. Price of the class was very competitive also, maybe the 2nd cheapest I found. But you really can’t beat this deal. Good price, good class, good instructor. Thanks! Lance Mitchell is a very professional, highly qualified instructor. For a person who is new to the gun owning business and never has shot before, he made me feel very confident on my choice of being a gun owner. Class was never boring, very informative, understandable and he’s very good on following up with communications and guidance. Thank you Lance for making my CHL experience unique, easy and fun. Highly recommended!!! This class was great. Lance Mitchell was great doing the instruction for both the classroom and the range. Never bored In class at all. Lance kept it upbeat and threw in some humor as well. Range time was well done and Lance made everyone relaxed to keep them focused. I highly recommend Lone Star [Gun Training] for your CHL class. Thanks Lance!!! OMG!! I cannot tell you how awesome the Instructor Lance is and so passionate and knowledgeable. I had never fired a gun before the class but I assure you, thanks to the hands on approach of Instructor Lance, I am going to go to the range every weekend. My only regret is that I wish I had thought about this sooner. Lance did a great job at making the class room portion of the course go by quickly, without getting bored to death. He gave you the information needed in a good, common sense way, with a bit of humor thrown in too. The qualification at the range was safe and efficient. I think Lance did about as good of a job as is possible for such a course and qualifications. I’d highly recommend this CHL class for anyone looking to get their CHL! I highly recommend Lone Star Gun Training. [The private pistol training I took from] Lance Mitchell made me feel at ease with my gun and gave me all the information I needed to feel confident at the shooting range. His CHL class was extremely educational, professional, and entertaining. I will definitely go back to him again for [more] one on one private lessons. “My husband selected this course for the entire family to engage and receive the required CHL training. The instructor, Lance Mitchell, kept the focus of the students with tasteful humor, while keeping the course training “on topic” and delivering professional course content. Lance delivered all the important requirements from the Texas CHL course material and structured the outdoor range exercise with precision. I also consider Lance to be respectful, professional, polite, and humble — leading to an enjoyable experience while taking the training course necessary to obtain a Texas CHL license. “We were scheduled to take a CHL class from another instructor this weekend and the class was canceled last minute so we looked around on Craigslist and found Lance’s class. He was able to accommodate four students on rather short notice. He answered our call quickly and was very helpful before the class even started. His class was held at The Holiday Inn Express in Georgetown which offered a nice comfortable seating area for all of the students. Lance was very well versed in the law and gun safety as a whole. His class was not only educational but engaging as well. The qualification was held on a private outdoor range. The thing that I really liked about that was it wasn’t crowded and offered us the ability to really concentrate on qualifying. Lance was well prepared. His educational aids (PowerPoint, posters, books, handouts, etc) were well done. He also supplied the class with coffee, soft drinks, and water throughout the morning which was definitely not a requirement but was much appreciated. “I took a private handgun training session with Lance last week. As I had minimal knowledge of handguns before this 2 hour session, Lance had to start with more theoretical stuff. I thought this might get boring after a while, but Lance made it very interesting and hands-on. I loved his paper gun to determine if my aim is off or not . Lance is very knowledgeable and even though it was over 100 degrees, he never lost his cool with me. I would recommend Lance to everyone that wants to learn how to properly handle their gun. When I am ready I will definitely sign up for his CHL class! 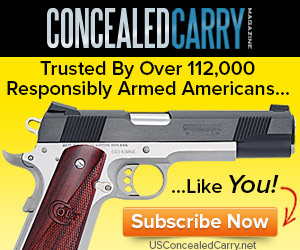 United States Concealed Carry Association.